More than 10,000 slightly used books, in English and Spanish, are being sorted and processed for this year's Friends Book Sale (Jan. 25--27) at Palm Beach County Library's Hagen Ranch Road Branch, 14350 Hagen Ranch Road, Delray Beach. Items are priced at 50₵ to $5.00 and include 19 categories of books for adults, teens and children, paperbacks, hardcovers, CDs, DVDs, audiobooks and specially priced items. Volunteers are needed to help with setup and breakdown as well during the sale. To schedule a volunteer session, please contact Danese Sloan-Kendall at 561 791-3018 or sloanken@aol.com. Will Have a Lasting Impact on the Community! As you make end-of-the-year donations to your favorite charities, we hope that you will consider a tax-deductible donation to the Friends of the Library. Your generosity has a direct effect on the quality of life here in Palm Beach County! Have you ever learned a new skill from a library event or workshop? Did a performance bring you joy or move you to tears? Have you walked in to a library full of children engaged in a story or science experiment? Chances are, Friends of the Library made it happen! Your donation goes directly towards funding the high quality, entertaining, and educational events you come to expect from the Palm Beach County Library System. Count yourself among the thousands of individuals that have donated to the Palm Beach County Library by clicking the "Donate" button above! The Palm Beach County Library System is offering the deal of the season. With your Library card you have access to FREE books, movies, music, computers, Wi-Fi, arts and crafts and more to make your holiday the most enjoyable ever. Why spend money purchasing e-books and audiobooks from Audible and Amazon when you can get them for FREE from the Library. Download the new cloudLibrary app and access e-books and e-audiobooks that you can read or listen to on your choice of personal electronic device. The app provides advanced search options, reading recommendations and a 21-day loan period. You can also use OverDrive for additional copies of e-audiobooks. Check out up to 50 items for your reading or listening pleasure. There is no need to pay for a subscription to Pandora or Spotify either. With hoopla and Freegal you can download and stream songs and albums to bring holiday cheer to any gathering. Keep the kids entertained during the winter break with movies, TV shows and video content available on hoopla. Visit www.pbclibrary.org to start streaming. When you have had enough of staying indoors get out of the house and bring the kids to the Library for story time, movies, crafts, playtime and much more. Check out the complete listing of activities online at www.pbclibrary.org/events. Happy new year from the Palm Beach County Library System! Thank you for making this year's Friends Annual Meeting & Appreciation Lunch a success! In addition to President Alice Chambers review of 2018 accomplishments, attendees were treated to keynote speaker Dr. Robert Watson, accomplished author and historian and distinguished Professor of American History, Lynn University, with his presentation, "POLITICS: Dysfunction, incivility...the Supreme court." Ingrid Eckler Scholarship winners: Kandace Ryan and Katrina Brockway (not pictured: Trent Mellinger and Brenda Gonzalez). Congratulations to all of this year's scholarship winners and thank you to Friends of the Library members for your continued support! Want to be up to date on what's going on in the Palm Beach County Public Library? Check out the online version of Happenings here. 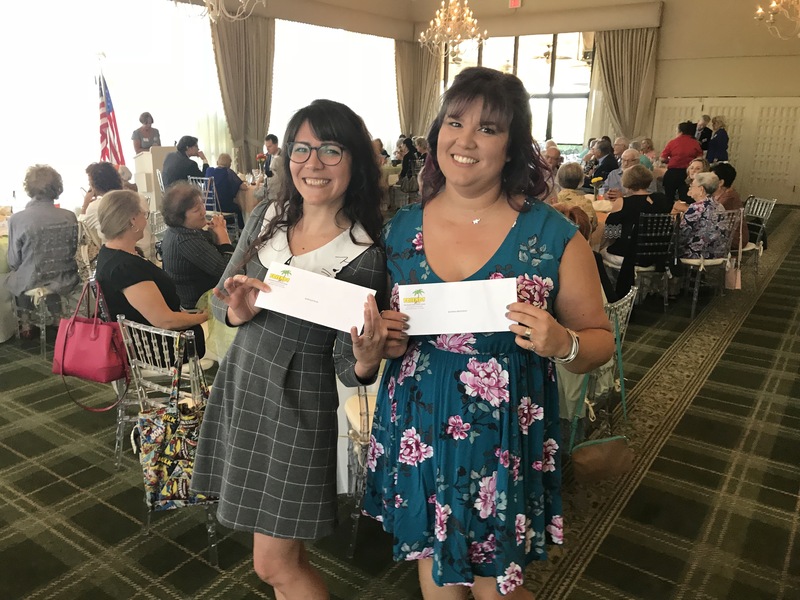 The Friends of the Palm Beach County Library serves to create an association of people interested in books and libraries. We serve to focus public attention on library services, facilities and needs. Raising funds for scholarships and special projects and to stimulate gifts to the collection, endowments and bequests. We endeavor to assist in the development of programs for the extension and improvement of library services and resources to adequately serve the needs of the population of the Palm Beach County Public Library System. Finally, we seek to advocate on the library's behalf in order to inform elected officials, as well as the public, about the services that the library provides to our community and their continued need for funding.